As we wrap up the Making Time to Write series, here are twelve tips for making the most of your writing time. As always, take what works for you. These are a mix of practical “boots on the ground” tips and those designed to enhance your brain’s readiness. 1. Think about your scene before you sit down to write. Play it in your mind, decide where you will start, and run through the mood. 2. Use Rachel Aaron’s method: Take five minutes at the beginning of each writing session to make notes on what you plan to write before beginning. 4. Conversely, some writers are good at training themselves to immediately continue after interruption by suspending or pausing the story in their minds. Use tip three or tip four according to what works best for you. 5. Use a timer, either the Pomodoro method or an adaptation that works for you. 6. Consider dong word springs with writer friends. This also helps with overcoming resistance, and is easy to do via Skype, Twitter, or your favorite social media. 7. Take a warm sower before your writing session. 8. Take a notebook to bed. Get comfortable and write until you fall asleep. 9. Cultivate mindlessness (a form of productive boredom). Walking, exercise, washing dishes, vacuuming, and similar tasks occupy y our front brain while your writer mind gets busy. When possible, go straight from mindlessness to writing. 11.”The desire to write grows with writing,” said Desiderius Erasmus. The more we write, the more we get into the story, the more we want to write. The more we desire to get words on the page, the more we will naturally look for time to do it. 12. Seek an accountability partner to encourage you and also deliver a swift kick when needed. Set goals and then report on those goals the next time you speak. I hope the Making Time series has been helpful and given you a few useful tips to try in your own writing life. Do you feel this series is helpful to writers? Which tips spoke to you? 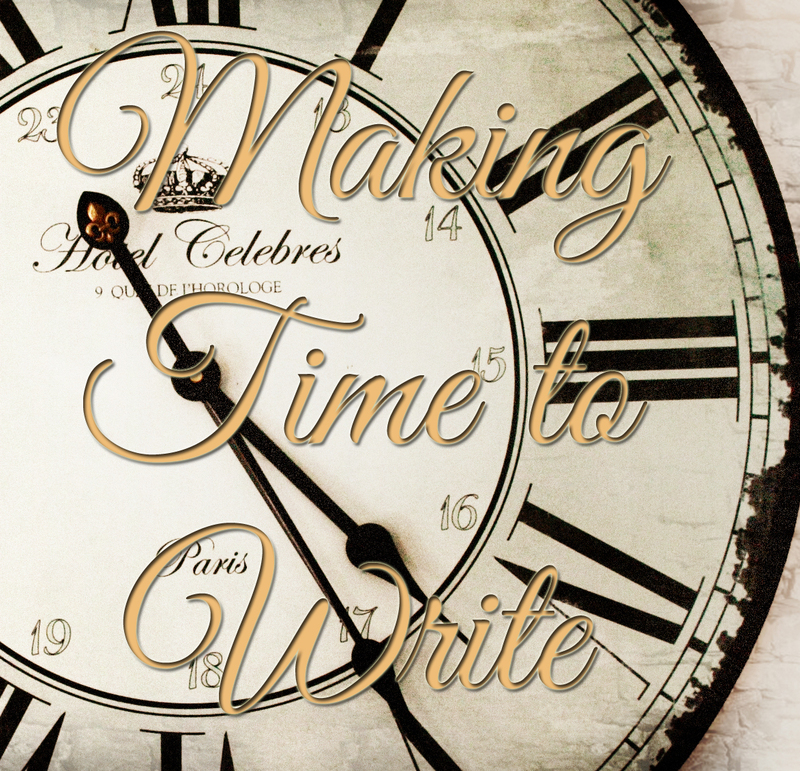 This entry was posted in The Writing Habit, Writers' Minds and tagged Making Time, Robyn LaRue, Tips for Writers, Writing Habits. Bookmark the permalink. But, when I am able to recognize the value of what occurs when I am mindless, it almost subconsciously sends a trigger to my brain that says, “hey, this is it dude – allow yourself to get into this state more often”. It’s not something you can necessarily practice, but you can practice creating the conditions that “cultivate” this state of mind. Thanks, as always, Robyn – great stuff! You’re welcome. 🙂 Thank you for the word “cultivate” as it is a perfect word for mindlessness. Creating the right conditions to allow it to happen is exactly right. I like the ‘take notes before you write’ tip. Having a vague idea about what I am going to write does prevent me from procrastination. This series has been very helpful. All the posts were an important reminder that no matter how much/little time I have to write, I have to be INTENTIONAL about it. I have to keep making writing a priority among our other responsibilities, even if they’re super important, like: jobs, family, etc .